Marcus Paley, Katie’s university friend, had intended to run in the Paris Marathon this year with the other university friends but quite rightly decided to pull out because his wife Alice was expecting their first baby at about the same time as the marathon. 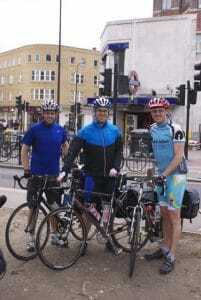 However, instead he decided to cycle from London to Paris with Alice’s brother and cousin on behalf of KHMT. 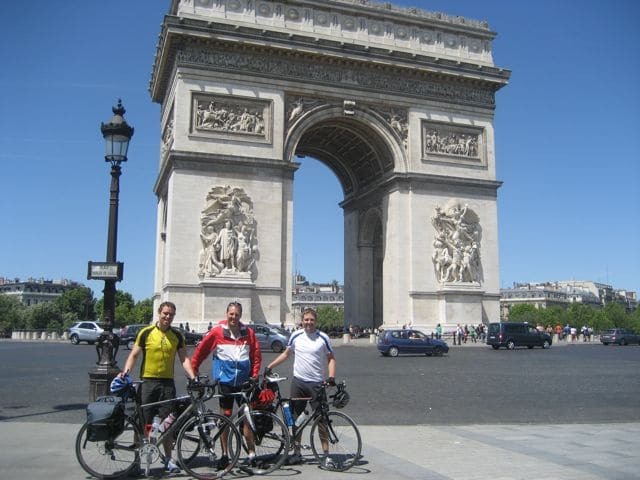 They left London on Friday, 27th May to cycle down to Newhaven for the cross channel ferry to Dieppe. Once on French soil, they took the “avenue Vert” for most of the way to Paris, stopping overnight at Gisors before arriving in Paris. Marcus says: Well we did it! Thank you for your kind sponsorship, you’ve helped me to raise £2,826 for Katie’s Trust. It means a lot to me that I have been able to support the Katie Haines Memorial Trust so generously. The trip was fun, but hard going at times – not least stepping off the ferry in Dieppe at 4 a.m. having had no sleep and setting off on another 70 mile ride! I also have the scars to prove my inexperience at using the clip-in shoes! Riding through the French countryside was wonderful and we were really surprised at how considerate French drivers were to us – certainly when compared to drivers in the UK. We reached the Ard de Triomphe at 1 p.m. on Sunday in beautiful sunshine, having negotiated heavy traffic around the French Open. I’d also like to say a huge thank you to Luke and James for their support on the ride.